When I first became vegetarian, soup was one of the first things I missed. Most soups that seemed fit to eat were made with stock. So, unless you ate tomato soup, you couldn’t be sure there were no animal products in the pot. As time went on, I learned to make soups with vegetable stock, but they were never as rich and complex as their, um, full-bodied cousins. Not until my friend and Soup Maven Julie Greenberg schooled me. It starts with a mirepoix, that magic mixture of chopped celery, onion and carrots, sauteed in butter or oil. Heat a big soup pot on medium-high, then add oil or butter (butter burns more quickly, so watch it) and when that is hot, add the diced mirepoix. Stir and saute for 5 minutes or so, until the veggies are a little wilted. Add 2 quarts of vegetarian stock, and bring to a slow, rolling boil. Add a bag of dried lentils, some chopped garlic, and a half-teaspoon of Indian Five Spice, and simmer for about 30 minutes until the lentils are soft. 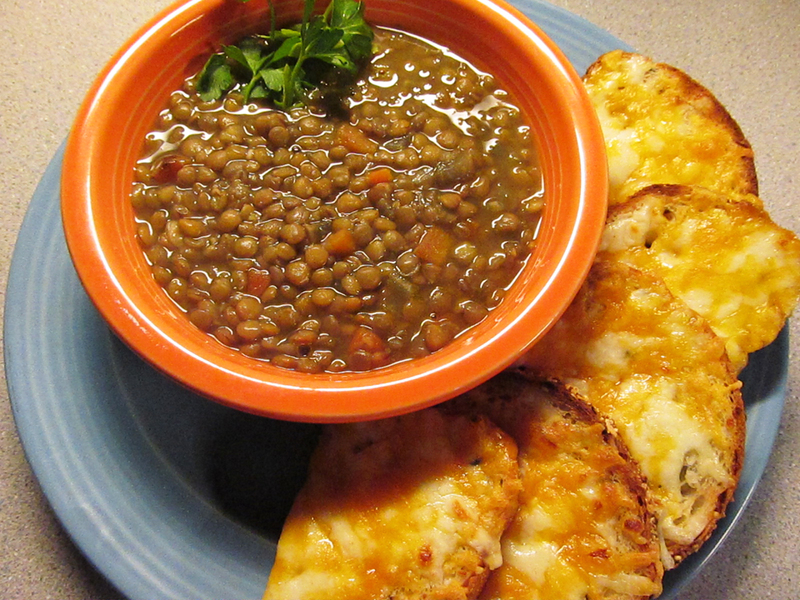 At this point, the lentil soup is ready to eat, served with cheese toast as shown or a pan of soft, fluffy, perfect cornbread. But if you want to kick it up a notch, stir in a jar of tika masala or korma sauce as “background.” People will think you slaved over this exotic blend of a soup. This entry was posted in Soups and tagged indian five spice, lentil soup recipe, mirepoix. Bookmark the permalink.